You know those pieces that everyone and their mother seems to own? 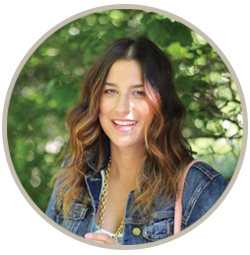 I’m talking about pieces like the J.Crew Quilted Vest, Hunter Boots, Ray-Ban Aviators, and Blanket Scarves. What do these items all have in common? They’re versatile, stylish and classic. It’s no wonder that so many of us gravitate towards them. Another ones of those pieces that so many people seem to own is a cargo vest. I picked mine up at Old Navy about a year ago, and it seems like so many other bloggers have the same one. Great minds think alike, right? I’ve worn this vest more times than I can count and have featured it on the blog a number of times. I’ve paired the vest with dresses, jeans, and skirts, but the possibilities are endless. What other pieces would you put into this same category? Too cute! Such a perfect fall look! 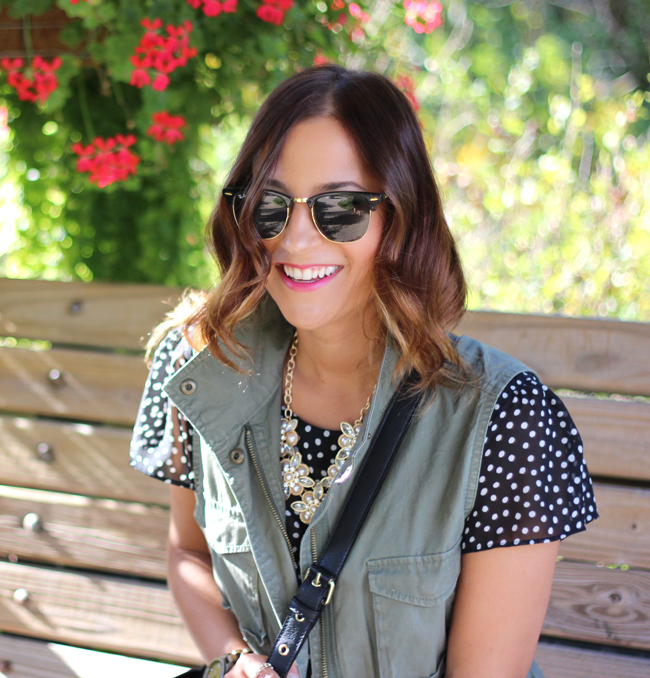 In love with that vest paired with the polka dots! Thanks Shannon!! 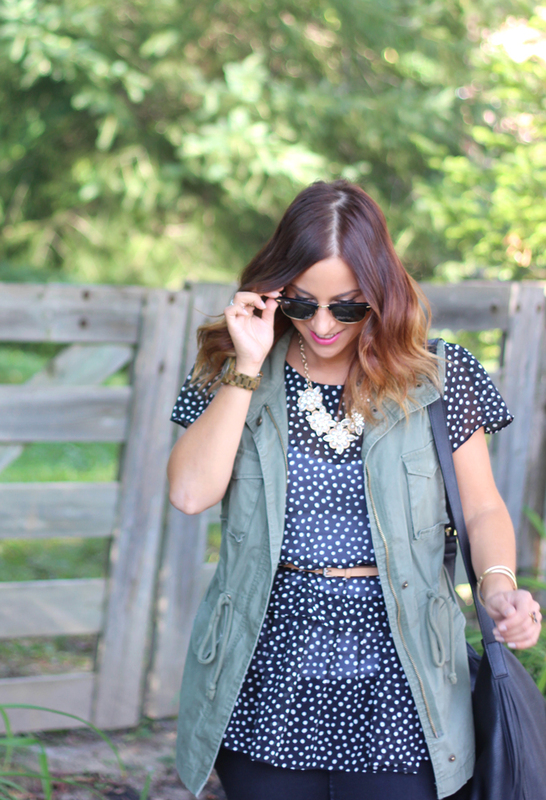 I always find polka dots are a fun pattern to style. I love this vest! That is a rest staple piece. Love the way you styled it. Such a cute outfit! 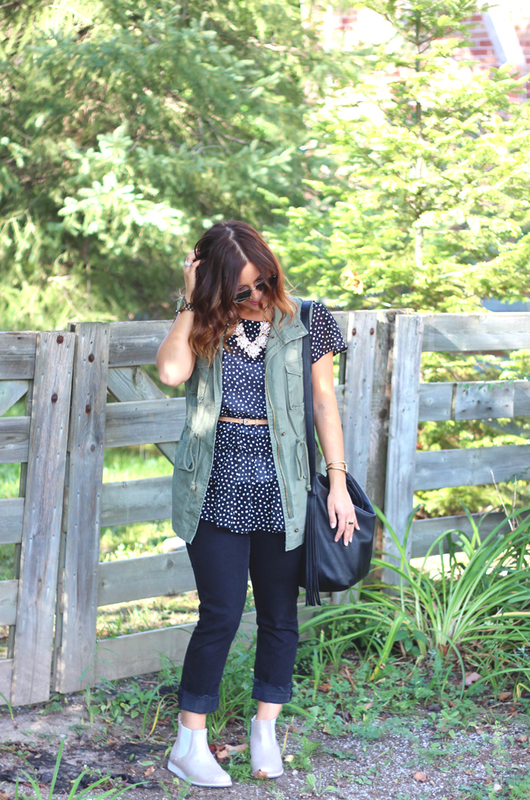 Loving vests this Fall! 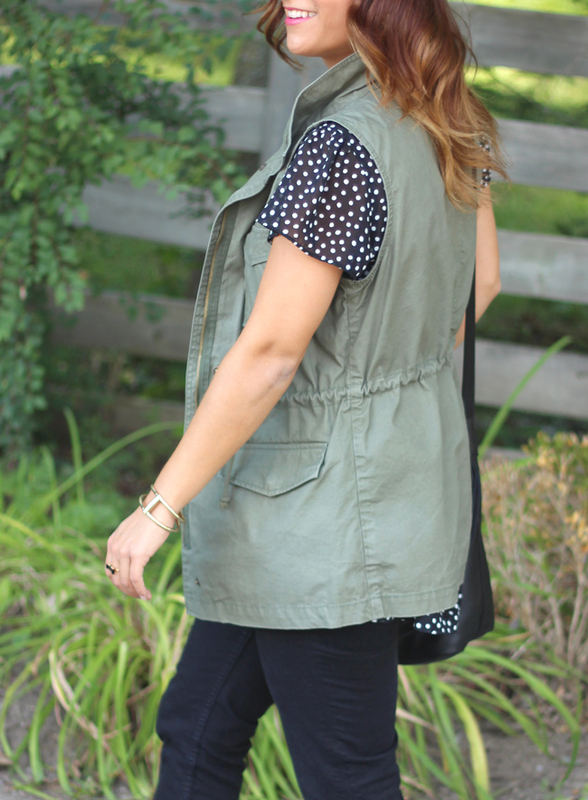 The cargo vest with the polka dots is SO cute! And I love those shorts boots! I can see why this vest is a must-have. Great piece for the fall. I’m going to admit, I have two of the four common items you listed! 🙂 I love this outfit! It’s good to know that affordable places, like Old Navy, have popular pieces like that vest! I love it! Definitely going to keep an eye out for that this season. I love this! 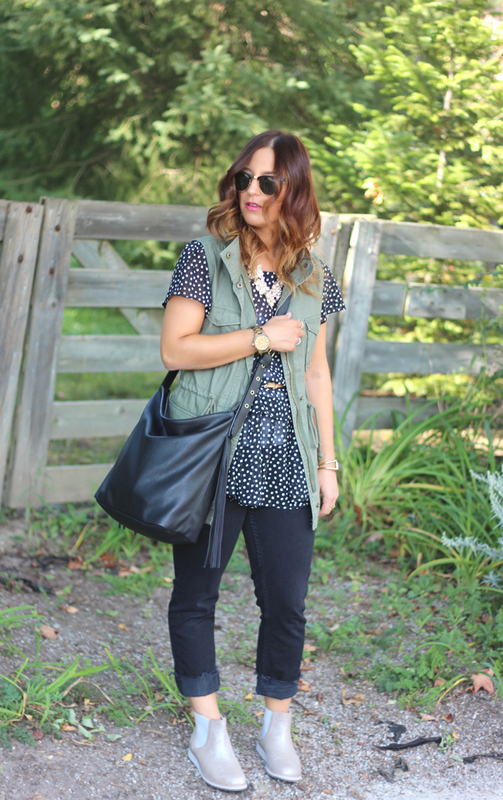 It’s such a classy take on styling a cargo vest! You look fantastic!! Love your vest!! I love this layered look! I’m on a lookout for a cargo vest now! I hope you find one! They seem to be out there, from what I can tell. 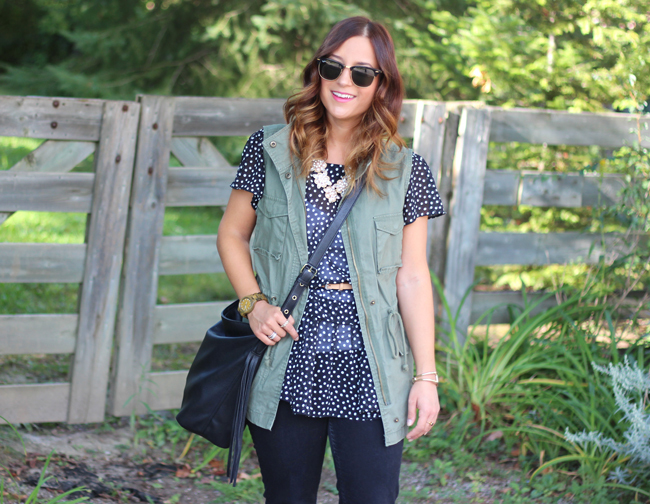 The cargo vest has become such a must-have wardrobe staple, love the way you styled yours here too! It’s one of those pieces you can literally wear with anything and look instantly chic. I’ve had my cargo vest for literally years and I will refuse to put it away! It is such a great fall piece!! I love it with the polka dots. No reason to put it away if it’s still working for you. I have so many pieces like that too! Your hair is on point! I love the loose waves! I also love how you paired a short-sleeve blouse with a vest! Thank you so much! I’ll be sharing a few tips and tricks about haircare soon, so stay tuned! You look so cute and amazing! Love this! I actually don’t have a cargo vest, but you make me want to get one cause you look great! Your photos are gorgeous- you are just radiating!! Love that cargo vest- I need one for sure.